Check out our February activities! 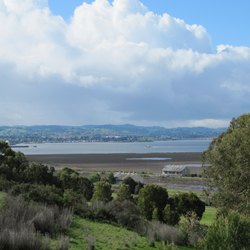 The view of Mare Island from the US Forest Service Regional Office. San Francisco Bay Flyway Festival Saturday & Sunday, February 10-11, from 9 – 4, Mare Island. We are looking for volunteers to help staff the Alliance table at the Festival’s Wildlife Expo. It’s a great way to experience the festival, meet new people, and tell them a bit about what the Alliance does in Vallejo (table will have explanatory materials, you don’t need special training!) If you’re interested, please email info@VallejoWatershedAlliance.org and we’ll find a shift that works for you. Hanns Park Field Day Saturday, February 17, 9 to noon, Hanns Park We’ll be cleaning up an area of the park that doesn’t get a lot of attention: there are trash and undergrowth/fire suppression tasks to help GVRD with maintenance. Wear sturdy shoes, clothes that can get dirty, hat, sunscreen and gloves. We’ll provide tools and refreshments. Park in the Hanns Park parking lot on Skyline just off Redwood Parkway, walk half a block up the street and through the chain-gate on the left. Or, you can walk up the trail behind the bathrooms, which are visible from the parking lot. RSVP to Info@VallejoWatershedAlliance.org.